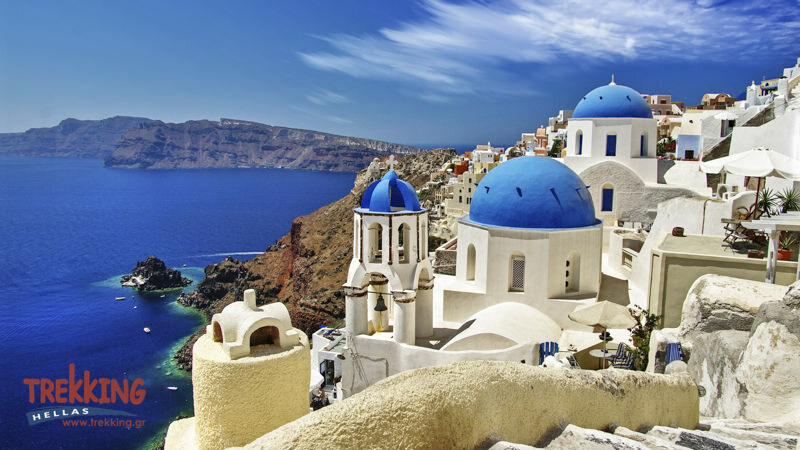 The Greek islands are the ideal scenery either for movies, like “The big blue” or for an unforgettable vacation. But, with so many gorgeous islands scattered throughout the Aegean Sea, the question arises: which ones to choose? 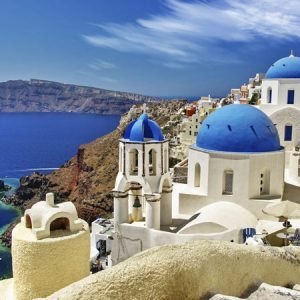 This trip combines probably the two most beautiful: The spectacular Crete and the precious gem of the Aegean, Santorini. 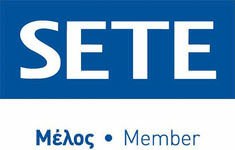 Your trip starts in Crete. Placed midway between Africa and Europe, Crete is a world unto itself. Landscape and history have collaborated to make it one of the most evocative and multi-faceted of the Greek islands, with a rich tapestry of canyons, mountains and, of course, blissful beaches. 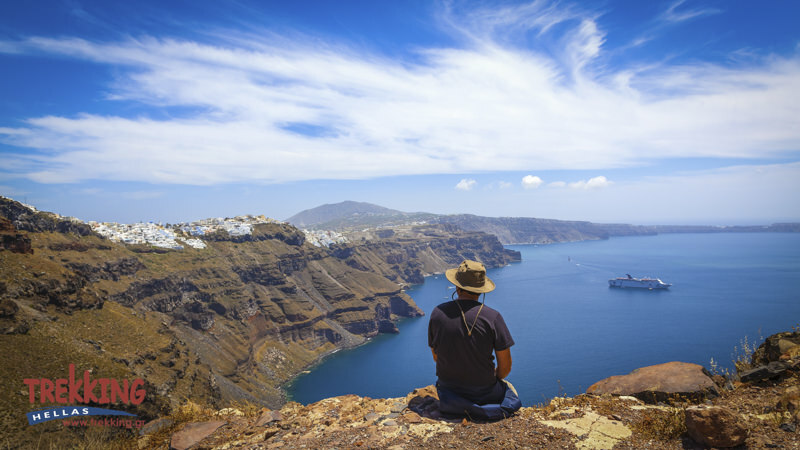 Afterward, we take the ferry to the world famous destination of Santorini. It is dramatic and unique, formed from the remains of a volcanic crater and even the most jaded traveler succumbs to the spectacle of this surreal landscape. During the days that follow, we explore the island from one end to the other. This trip level is moderate. 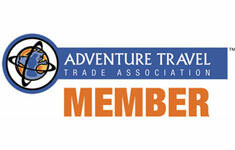 Included meals: Breakfast, lunches, and dinners as indicated in the itinerary, snacks during activities. 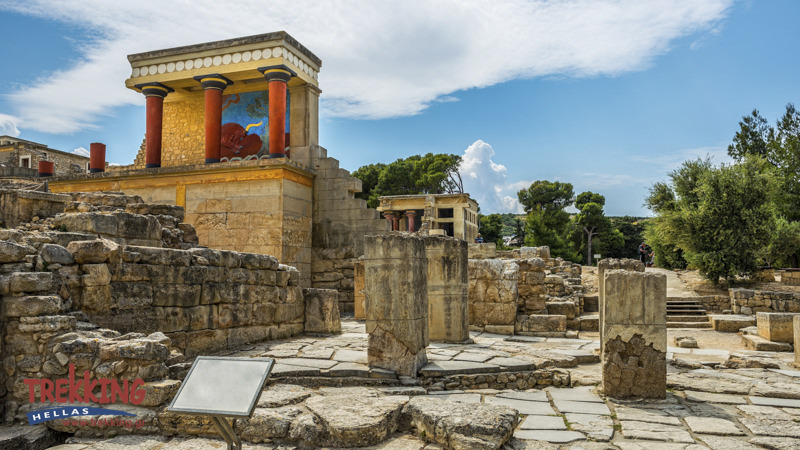 Located in the center of the island, the sprawling city of Heraklion is home to a magnificent archeological museum and lies just a few kilometers from Knossos, the greatest of the Minoan palaces, at the heart of Crete. In the afternoon we meet at your hotel and after a brief orientation meeting, we set off to explore the old part of this lively city. To conclude the night, we enjoy our first dinner together in a traditional Cretan restaurant while getting to know each other in eager anticipation of our adventure. We start our day visiting the Archeological Museum of Heraklion, with the finest collection of Minoan artifacts in the world. 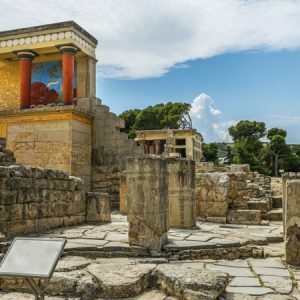 It’s a great introduction to Crete’s biggest attraction, the 3500-year-old Minoan palace of Knossos, a sprawling maze of royal chambers, grand staircases, storerooms, and workshops. After lunch, we head towards the wine country of Heraklion. Locals claim, with some justification, that wine has been being made in the area for four thousand years, probably using grape varieties not far removed from the ones that we are going to try today. 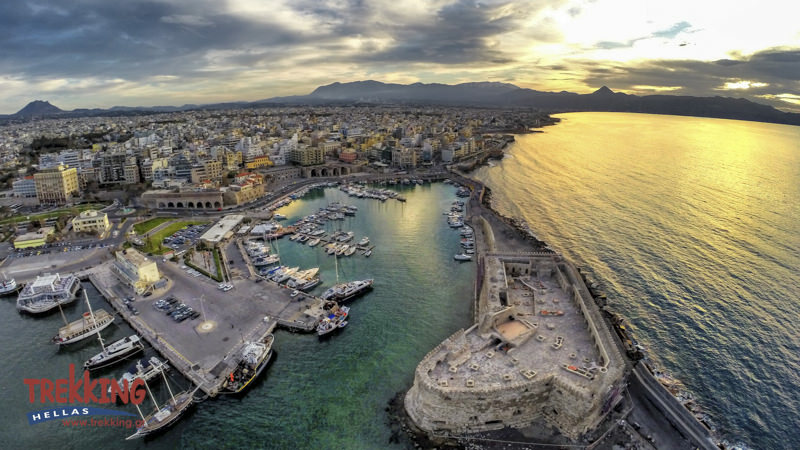 Our day ends at the city of Rethymnon, the island’s intellectual and cultural capital, which is going to be our base for the next days. Ancient Eleftherna, a Dorian build settlement, lies in the foothills of Psiloritis, the highest mountain of Crete, is included in the top discoveries of 2009 of the Archeological Institute of America. We start our hike from the ancient Acropolis of the town. On our way, we pass the remarkable Roman cisterns, carved into the hills westside, the Necropolis, and a 3rd century BC ancient bridge. We finish our hike in the tiny village of Margarites, known for its pottery, where we visit a workshop. We learn about the traditional techniques from a local potter who derives inspiration for his ceramics from Minoan and Byzantine originals. In the afternoon we explore the labyrinthine lanes of the historic quarter of Rethymnon which still preserves much of its Venetian and Ottoman appearance. 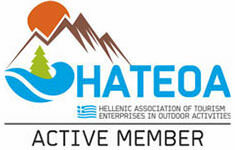 In the southern slopes of White Mountains, there is one of the most fascinating gorges in Crete. Aradena gorge is not as famous as Samaria gorge but is in physical terms as impressive and much less crowded. Moreover, the hike itself is challenging and the sense of achievement is immense. We start from the abandoned village of Aradena and we descend all the way down to the Libyan sea with the beach of Marmara at the end as a reward. After lunch, we take the coastal path towards Loutro and we enjoy awe-inspiring views of the dramatic, rocky seascape while breathing in the fresh, salty air of remote and unspoiled beaches. One of the delights of traveling through Crete is food. 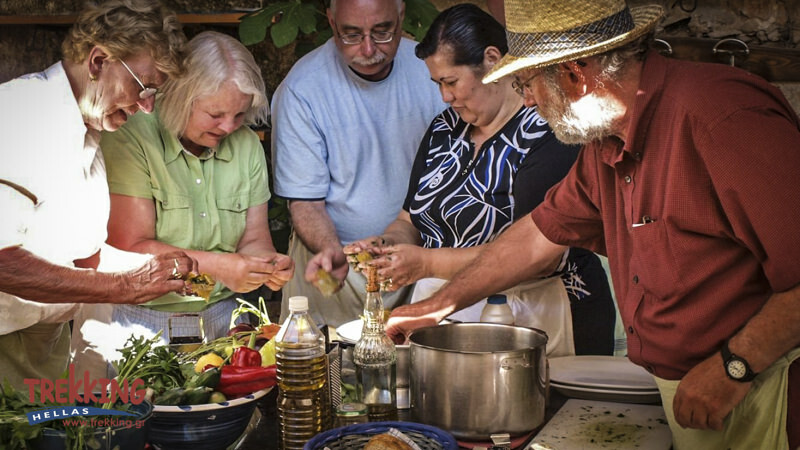 The local cuisine has its own distinct identity within Greek cooking and great claims are made for the Cretan diet, which is the base of the famous Mediterranean diet. After breakfast, we drive toward the quaint village of Vamos for a cooking class which takes place in an old olive press dating from 1846. 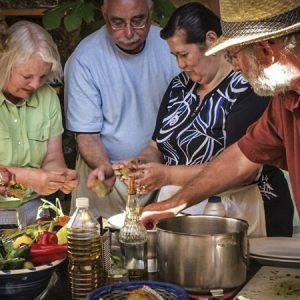 In a unique setting, we take a ride on a “journey” into the aromas and tastes of traditional Cretan Cuisine. 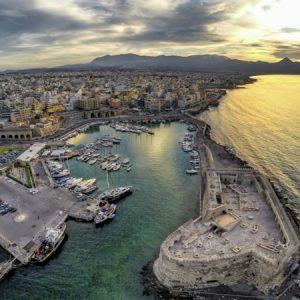 Early in the afternoon, we drive to Chania, one of the most beautiful towns of Crete, littered with a remnant from its Turkish and Venetian past and bustling with harbor-side life. Today we catch the morning ferry to Santorini which was the site of one of the largest volcanic eruptions of all time. Here everything is brighter: the whitewashed cube-shaped houses, the lapis lazuli sea and the sunsets that light up the caldera. We settle in our hotel, located next to the sea, on the famous black beach of Kamari and we transfer to the modern capital of the island, Fira. From there, we hike towards picturesque Oia, the most beautiful village of the island if not the whole Aegean sea. The cobblestone trail follows the rim of the Caldera, takes us away from the crowds, permitting to admire the power of the natural forces that shaped this amazing environment. Finishing the walk it is time for kayaking. We explore the south side of the island as few people do. 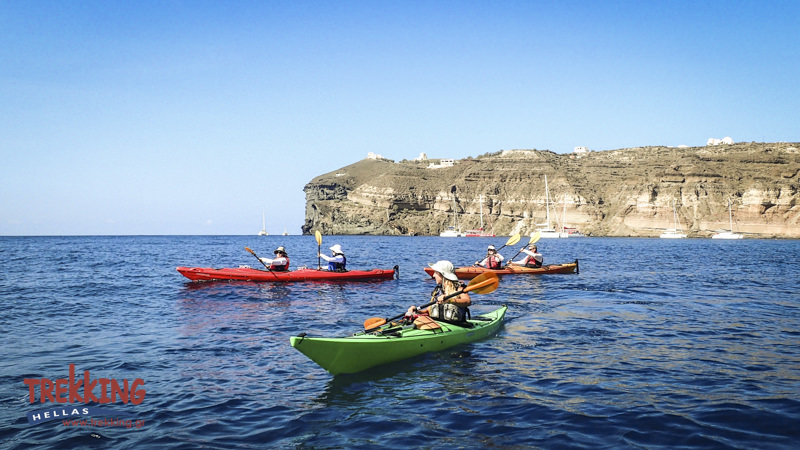 Seeing Santorini from the sea level is a real treat, plus paddling gives your upper body a bit of exercise. We paddle by the Red and White beach with stops on the way for swimming and snorkeling. Medieval Santorini comes to life in the lovely village of Pyrgos, which used to be the capital of the island, where Cycladic houses blend harmoniously with the Venetian manors and the few remaining old stores. 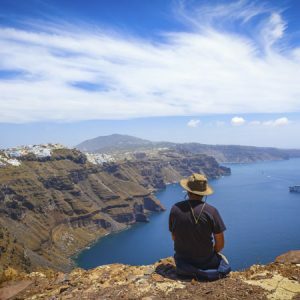 Here, we start our hike, which takes us to the highest point of Santorini, and from there to the ruins of Ancient Thira, located on a headland between the two popular beaches of Kamari and Perissa with dramatic cliffs plunging into the blue waters of the Mediterranean. The change of scenery will make us feel like we are on a mountain, and we experience the diversity and beauty of this amazing island at its full. After visiting the site, we finish our hike in Kamari village and our hotel. We rest before heading to Fira for the farewell dinner in a restaurant overlooking the Caldera. Day pack to carry a camera, water bottle, and snacks, etc. 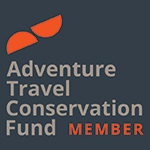 This trip Level is moderate and is suitable for most people that are in good physical condition. Although the daily distances are not that far, it has been rated moderate as there are quite significant elevation gains and losses. Some days are a full day of hiking; others involve exploring ruins, villages, and towns on foot. 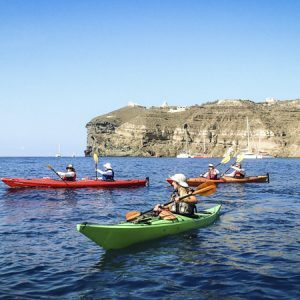 It includes walking tours in cities and villages, and four days with moderate hikes of 3-4 hours, including one sea-kayaking day with no previous experience needed. Although the paths are quite well-kept the terrain in Greece tends to be very stony and rocky, especially during the gorge-walking. You will mostly be walking on unsurfaced tracks, footpaths, mountain trails and on some tarmac roads and be prepared for some steep ascents and descents.